Originally published on February 21, 2012. Okay—this show is late, which inspired the title of the show. 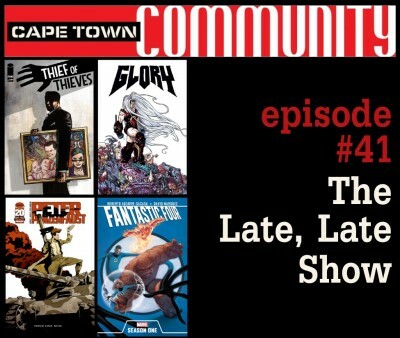 Don is on his lonesome this week but he’s got the rundown on a bevy of new books that have hit the comic shelves over the last two weeks. He also spends a few minutes talking about getting ordained, Robert Kirkman’s criticism about superhero comics being stale, and AMC’s new series Comic Book Men. 00:11:31 Thief of Thieves #1: Nick Spencer’s knack for fun dialogue saves this new crime drama. 00:19:58 Severed #7: Scott Snyder, Scott Tuft and Atilla Futaki score an absolute homerun with the conclusion of their scary story. 00:24:19 Secret Avengers #22: Rick Remender seems starts thing off strong with this official beginning to his run on the series. 00:28:25 Venom #13.1 and #13.2: Rob Williams spins a fun yarn co-starring Hulk, X-23 and Ghost Rider. 00:33:00 Last of the Greats #5: While it doesn’t have the shocking ending of the previous issue, it’s hard not to be intrigued about where this book will head next. 00:36:38 Frankenstein, Agent of S.H.A.D.E. #6: Frankenstein in the middle of the Vietnam War—why aren’t you reading this? 00:41:49 Avenging Spider-Man #4: This one is not for the Hawkeye fans. 00:45:43 Road Rage #1: Do you like carnage? Then you’re gonna dig this. 00:49:50 Mondo #1: While it wasn’t Don’s thing, this might appeal to appreciators of more indie fare. 00:52:25 Glory #23: The Rob Liefeld renaissance continues with another solid entry from his former Extreme Studios catalog. 00:56:41 Peter Panzerfaust #1: Kurtis Weibe and Tyler Jenkins may have something very special on their hands. 01:00:16 Batman #6: Why do we keep talking about this book? Because it’s excellent. 01:03:15 Fantastic Four: Season One: It’s not fantastic, but four might be accurate.